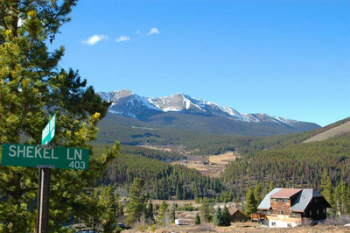 Long-term, local families are the primary residents of Silver Shekel, a neighborhood on the north side of Breckenridge. The three tiers of Silver Shekel homes for sale are just east of Highway 9, and stack up like a natural pyramid from its base near the highway up to its peak on Silver Circle. Just over this crest, is the Highlands neighborhood that wraps around Silver Shekel like a mink stole. The free countywide bus system stops at the bottom of the Silver Shekel neighborhood on Highway 9. The intersection can be busy and the Colorado highway department has plans to build a round-about here. Ready to start your home search? Browse the Silver Shekel real estate listings below, or learn more about this community. Except for a few trees, nothing obstructs the views of the Tenmile Range from most of Silver Shekel real estate because the subdivision was platted on stepped roads. Many of the homes for sale in this subdivision were also built on two or three levels to take advantage of the views and the sunshine. The earliest Silver Shekel home built in the ski era was finished in 1964. The neighborhood has A-frames, round houses, and many newer mountain contemporary homes, and 16 lots still undeveloped. 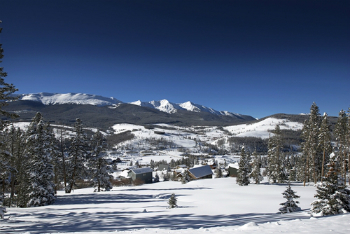 Silver Shekel, Breckenridge, is just 2 miles north of downtown, and is less than a 5 minutes drive. Trails through the neighborhood and the bike path just across the highway make it possible to walk or ride to town, or into the national forest. The 27-hole public Breckenridge Golf Course is on Tiger Road, the next road north of Silver Shekel. Size: 740 sq. ft. to 4875 sq. ft. Amenities: not in town limits, trails, on free countywide bus route. From the traffic circle on the north side of Breckenridge, go north on Highway 9 for 2.5 miles, turn right onto County Road 400, or Fairview, and continue around the Vienna Townhomes. Silver Shekel is divided into three filings, each on one road, the first will be straight ahead on Fairview. To get to the second, that the left hand fork, go uphill for two-tenths mile and then turn right on Shekel Lane. For the third, continue uphill to Silver Circle, a flat loop at the top of the hill. Are you ready to talk to an expert from Breckenridge Associates? Send us a message online or call us at (970) 453-2200 today!